Pours an amber-golden color - a bit hazy - with a nice head that doesn't leave that much lace. It has a nice hop aroma...a little differnet though; good hoppiness but still a little unexpected...which was actually quite nice. The taste has the expected hoppiness that should come from a imperial IPA but that flavor is immediately taken over by the sweetness of this beer. It almost has that Dogfish sweetness to it...very nice and incredible that someone can pull off this combo. Overall great beer...I just wish it had a little more "oomph" to really solidify the imperial quality. Other than that, great beer, nobody should miss out on this one. It appears that since the picture of this beer was posted on the site it has received a new look. The new bottle is pretty cool, but it looks like the old one was cool also. 12 oz. Bottle poured into a 'Ball Mason Jar'. L: Golden and transparent appearance. Poured aggressively into a 16 oz jar, a 3 finger head quickly dissipates to a lingering spotty ring with mild lacing coverage. The appearance does not take away from this beer. Having said that, it does not set it apart from relevant others in any distinct fashion. S: A somewhat surprisingly mild smell for a 9% abv imperial IPA. Nonetheless, I want to say it has a strong caramelized pineapple-mango scent possibly with mild honey undertones. A good balance of citrusy hops and mild malts, adding a mild grassy scent underneath it all. T: 9% abv is nearly impossible to gauge with this one. Other than a lingering warmth across the palate after swallowing, it is hard to tell it's a 'double', or 'imperial', IPA. Something about this finish is remarkably good. Hop presence is noticed over it's malty characteristics, often the case for the common IPA today. A level of the 'pineapple-mango caramelization' sticks around for the palate after already pleasing the nose. A sensational experience to say the least. F: The lingering warmth mentioned previous is what really drives the 'feel' of this beer. The hop and malt presence does not overwhelm, or compromise any part of this beer, providing for a tremendously enjoyable brew. O: Honestly, I had reservations before trying Hop Rocket. First, I was in the market for some of Bell's Hopslam, but apparently Bell's is uninterested in providing a decent supply for the massive demand they have produced. So Hop Rocket jumped out to me as a viable MI microbrew option to replaced my thirst for some Hopslam. Not only was this beer not my first choice, I had hesitations about Arcadia themselves, as a brewery. In fairness, I gave a lot of their beers only a small chance a few years ago when I first started drinking beer frequently. I'll have to give them a second chance, because they really proved their ability to make a solidly sensational imperial IPA. Bravo Arcadia. 12oz bottle, served in a standard pint glass. A - pours with an inch of frothy very light tan colored foam, sitting atop a clear burnt golden liquid. minimal sticky lacing comes and goes throughout the drink. S - tropical - mangos, pineapple, grapefruit...hops joined by a solid amount of sweet caramel malt. T - very sweet, hops again come across in the citrus profile, some pine as well. solid amount of malt adds a lot of balance, almost a tad too much. still plenty bitter, just done with some grace and charm. just a barely noticeable alcohol burn as well. M - very thick body, carbonation is subtle yet tight. very creamy and goes down smooth, leaves a lingering pine and caramel aftertaste. D - very solid, though not quite as good as it was out of a cask. a stereotypical East Coast DIPA with a ton of malt to match the hops. pretty dangerous for the ABV, goes down easy. Pours a nice hazy orange. Fairly simple on the nose - pine and citrus fruit punch. Something a little spicy showing up on second sniff. Very piney flavor, a bit of grapefruit along the edges with a pretty solid caramel malt body. I love the way this sweetens after the pine bite before slowly slipping off the tongue. This should be a christmas beer - it's like drinking a christmas tree, and not in a pine sol kinda way. The mouthfeel is a little oily, but becomes a creamier toward the end, leaving a little bit of douglas fir and spice to linger. This is maybe a little one-note, but exceptionally drinkable and a nice change of pace from the standard DIPA. Nice call on the extra Hoppymeal. Really like this one and am pleased to learn its accessible in the area. The beer guy at Rodman's recommended this. I assured him that anything called "Hop Rocket" was bound to be an easy sell with me. Poured into a DFH barrel pint glass, the Rocket appears a bright amber/orange color, but cloudy with specks of yeast sediment floating around. Had I known this was a bottle-conditioned beer I would have taken greater care with the pour (hint: give us a heads-up, Arcadia!). Still, it's nice looking and delivers a frothy two-finger head of foam that dies down over time but leaves behind good lace. The nose is alive with hops. Effervescent pine and deep citrus abound. Sweet and malty, but sharp and assertive. This beer smells like freshly squeezed hop juice. Whoa, this one also really packs a serious mouth punch too. Sweet and tangy up front, the Rocket really hits hard and fast. For a brief minute, you could almost mistake this for grapefruit juice. But that quickly fades, and you soon know you're drinking a damn fine double IPA. Big on citrus and pine again, but it also serves up a healthy portion of malty sweetness. Mouthfeel is chewy and smooth. A totally drinkable beer, no matter how big it is (how big is it, by the way?). Goes down easy, maybe too easy, and doesn't offend with any over-the-top alcohol aftertaste. Really good beer here. Find it and drink it down. slightly cloudy amber with a thin layer of off-white head that dissipates quickly and leaves little lace. aroma is surprisingly sweet. caramel and honey malts are prominent, with a rounded, lovely backing of citrusy, grapefruity hops. taste starts with some balance; caramel malts, citrus rinds, grapefruit and pine hops; finish is dominated by piney, oily hops. feel is moderate for the style, which helps the drinkability, but the stiffly bitter finish sticks to the teeth and is a bit harsh. i'm still smelling the empty glass for the aroma, but the hop flavors are just a bit too assertive. Acquired from pochman, courtesy of BA Secret Santa 2009 so a big "Thank You" goes out to him. Poured from a 12oz bottle into a US tumbler pint glass. A: The beer is a murky amber color, with a thin off-white head that fades slowly and leaves a thin lace on the glass. S: The aroma contains fruity citrus, grassy hops and caramelized malts. T: The taste starts out sweet with strong flavors of citrus and caramel. Then a nice hops presence comes in and although it's a little weak for the style (despite the name) it still works quite well for this beer. The malt character is hearty but not too heavy and provides a good balance. The after-taste is slightly sweet. M: Smooth and very crisp, medium body, medium carbonation, finish is slightly sticky. D: Very tasty, goes down quite easily, not too filling, strong but disguised kick, good representation of style, this is a very good beer to drink for a long time. An orange body, slightly hazy, with a two finger ecru cap. The head fell rather slowly and left some rings of lace around the glass. The aroma was more balanced than I anticipated from the description on the bar menu. Pithy grapefruit, oranges, and sturdy toasted malt propping up a large amount of hops. The flavor profile is sweet up front, with oranges and caramel hitting you first. Perfumey hops and toasted malt carry through the middle before a rush of juicy, bittersweet grapefruit and orange sweep in for the finish. Medium bodied, chewy profile. Carbonation is on point. This is a nice, well-balanced dipa. The hops definitely poke through and win the battle with the malt, but the malt is extremely sturdy. 12oz bottle (notched G-3) into a Foothills pint glass. Many thanks to my homebrewing buddy's wife's brother (whew!) for lugging a sixer of amazing Michigan brews down my way. 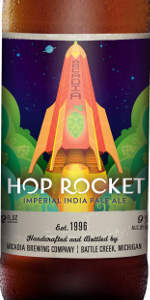 Arcadia Hop Rocket pours a brilliant, rust-copper color with a core of shiny gold. A towering inch of limestone head drops quickly, but forms a stubborn cap of tightly-packed bubbles that cling to the inside of the glass and drape sticky lace. Big backbone of toasted caramel malts forms the bulk of the aroma, but sharp citrus & resinous, fresh hops notes dart in and out of the sweetness. Fruity, too, with suggestions of tangerine, mango, and papaya. Whoa momma! This is one tasty IIPA...juicy & fruity, like a delicious conglomerate of melted Starburst and Skittles. The malts are crisp and English, with toffee and biscuit, but the hops...oh my, the hops!! What did Arcadia do to this beer? Juicy, resinous, piny, candy-drizzled, fresh, and bitter all at once! Beautiful hopping technique...I must learn it. A gentle kiss of booze mingles with more fruitiness on the finish. Slick, almost syrupy mouthfeel, but thins out towards the end. A bit under-carbonated, but still very well put-together. All in all, Hop Rocket is an utterly unique IIPA, combining the Pacific Northwest hopping style with a boat-load of fresh English malts. Did I mention the 9% was well-hidden? Fantastic beer. Bottle from The Wine Seller in A2. Pours cloudy yellow, creamy white head on top. Smell of pine hops and not much else, a little dusty and funky, with no malt presence in the aroma. Taste is extremely muddled and fails to hide any alcohol flavor, some dusty old hops, very little malt backbone as far as I can tell with no influence on the taste. Chewy mouthfeel and sort of flat. Wondering if I got an old/compromised bottle. This was not good. Very floral and fragrant nose, herbacious tones, notes of pine, perhaps a little bit of grapefruit, oregano, marijuana. Bitter taste, not as dynamic as the nose led me to believe. It is not very sweet at all, which is nice since I sometimes have trouble with how sweet Double IPA's can get. Nicely carbonated, scrubs the tongue a bit. Medium body, crisp clean finish with some nice bitterness and a tad of late dryness. Went great with a slice of pepperoni pizza.